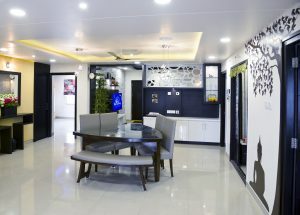 Home / UncategorizedA beautiful and elegant home in Hyderabad!! 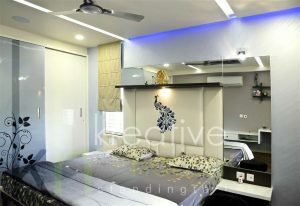 A beautiful and elegant home in Hyderabad!! Selecting a decor style for your house can be quite confusing! 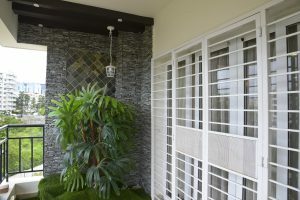 While planning the decor of their three-bedroom house in Hyderabad, the owners were unsure which style they wanted – designs that were simple and contemporary or strikingly artistic. Leaving it in the hands of the architects at Kreative House, the house transformed into a harmonious creative blend of both styles, with elegant murals and striking cut work panels beautifully enhancing the simple contemporary look of the residence. Let’s have a look! A black and white colour palette is a striking and evergreen contemporary element. Tempered with tones of grey and beige and dotted with innovative hanging lights, the area looks stylish and trendy. 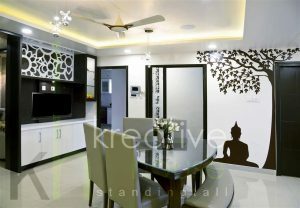 The Buddha and Bodhi tree murals on the wall add a dollop of artistry that is complemented by the cut work panel in the wall that separates the living and dining areas and also gives the furniture a chic appearance. Recessed lighting in the ceiling is another trendy touch that lifts the style quotient. The focus of the dining area is the ingeniously designed triangular table with four chairs and a bench. This simple yet eye-catching arrangement is perfectly complemented by the artistic patterns on the walls. A trendy piece of furniture against a third wall strikes an excellent modern note while the flowers on it add a lovely splash of colour. Also note the spotlights that border the recessed lighting, giving the ceiling a unique, contemporary appearance. Murals are a key element in this delightful house and the striking design on the back splash in this cool and elegant kitchen adds a dollop of style. 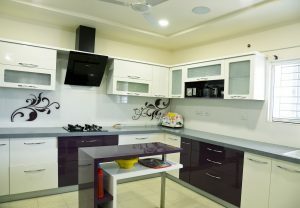 Livening up the area, purple is a rich and vibrant choice to add colour to the decor. The sleek grey counter top and ingeniously designed kitchen island in the middle contribute a trendy note. This gorgeous green corner in the balcony is a sight for sore eyes! The lush plant has a backdrop of a stylish rustic slate wall fitted with a trendy mosaic. The cute lamp hanging from above is an excellent choice to match the rustic ambience of this little haven. What an ideal space for relaxation. The innovative merging of creative artwork with neutral colours and contemporary designs has resulted in the creation a beautiful modern residence by the professional team at Kreative House. ← Make your home Diwali Ready!! How to Pick the Right Hob for your Dream Kitchen ! !